This blog is comprised of android app reviews done by a novice reviewer :) Please follow/subscribe to my blog. 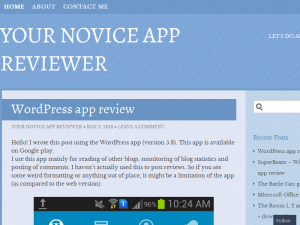 This what your Your Novice App reviewer Blog Ad will look like to visitors! Of course you will want to use keywords and ad targeting to get the most out of your ad campaign! So purchase an ad space today before there all gone! -Collage Maker: 300+ different collage templates for you to combine photos in different ways, you can even customize templates to suit your needs! Design your own photo creation! Anything is possible! -Crop & Resize: Supports horizontal and vertical cropping & resizing. Crop & Resize your images in different aspect ratio. -Filter: 50+ exquisite filters, including beautify, retro, landscape, halo, black & white and all sorts of festive filters. Bad or good weather, you still can make photos better! -Stickers: Personalize your photo collage with 500+ stickers and cute emoji. -Adjust: Adjust your image’s brightness, contrast, saturation and hue value. -Text: Supports various types of font styles and colors. Write some word, let the photo tell your story. -Backgrounds: 80+ varieties of backgrounds! -Blur: Edit the level of background blur with a single tap! -Retouch: The latest smart facial recognition tech helps soften wrinkles, even out skin tones and remove blemishes instantly with a single tap. Make you be sweet like a candy ! -Slideshow: Create slideshows with up to 50 images. Produce music videos with super support for all kinds of format, like mp3, m4a, aac and so on. Let your imagination go wild! -Scrapbook: Design your personal scrapbook. Let your great tastes guide you through! -Filmstrip: Supports horizontal and vertical filmstrip creation. Convert your filmstrip into a sketch with a single tap. -Twinkle: Turn your photo into a piece of art and make it come to life! -1-Tap Share: Share photos and videos on social platforms or communication apps, such as Facebook, SnapChat, YouTube, Messenger, WhatsApp and so on. Make ordinary photos look fantastic with 60+ animated filter effects. Whether you’re on your own, with a friend, with family, or with however many people there are, Wow!Filter will preserve and add magic to your wonderful moments. Not all moments are fun, but Wow!Filter always is! Pie face game filter is waiting for you! Now we even have prom queen live filter to match your prom dress and fire dragon live filter to clean your bad mood. Take a selfie, let Venus Filter detect your face, work its magic and get the look of your dreams, including Elf, Flora, Bow, Boheme and even Hepburn (Yes! Audrey Hepburn!). Reveal your true beauty and attract others without even trying. I tried this app solely for editing photos for my Instagram account. I have found that this app is definitely packed with features. Mostly I use the Grid feature. But for the purpose of reviewing this app, I also checked out the other features (though not all). As you can see, you can edit the grid, layout, add smileys, add/edit text, add backgrounds etc. You can do a lot with this app. I really hope they would add more artwork styles on Twinkle! I think I was not able to try the Filters, because of course that would require taking a selfie (haha!). But it is a must try, most especially the Venus Filter. The PhotoGrid works very much like a social media app: you can follow other users and like/comment on photos they have uploaded. You have the option to use Filmstrip though instead of the Grid. I did not use the Filmstrip because you can only arrange each photo straight vertically or horizontally. I really wanted the whole photo to fit the requirements of Instagram (sort of square-ish in size) and make the most of the available space thus I used the Grid. Journal that motivates you to write more, by viewing your writing as a color gradient. Invest in a journal that helps you commit to writing regularly. Record your daily events and relive them as a rainbow gradient. • Fundamentally unique way to write quickly during the day. • Organize diary / journal entries using #tags (‘#’ before any word you write). • Revisit your past with Time Machine – shows you an entry from the past. I just found a journal that I will be using from now on, so I could list down what I’ve done at work and for school. I like this app because of the colors! Plus, the user interface is very simple and easy to use. You can view your journal entries individually or by month. You can also edit your entries anytime. Colorful lines on top of the dates indicate there are entries for those dates. As I have said, this journal is quite simple and this works for me. THIS GAME IS MEANT TO BE PLAYED WITH FRIENDS IN PERSON. IF YOU ARE ALONE YOU CANNOT PLAY! Dark Stories is an easy to play and fun game but some of the stories are quite difficult. All the stories are fictional. To solve them, the players will need to prove their skills as detectives. Dark Stories must be played in group. A person -chosen as narrator- picks a mystery and reads its description aloud. Then he/she reads its solution without telling the other people. The rest of the players then have to make questions in order to solve the mystery. The narrator can only answer the questions using “Yes”, “No” or “It is not relevant”. The only possible solution is the one given at the back of each mystery card. If the answer is still not clear enough, the players must follow the narrator’s interpretation of the mystery. When the narrator considers that the story has been solved enough, the narrator can conclude the game and read the whole solution. It is up to the narrator to give some clues if the story is in a deadlock. It is perfect for birthday parties, camps… and every situation in which you join several friends. This free App includes more than 50 stories and we will add new stories periodically. Accidents, suicides, thefts… Will you be able to solve every mystery? If you and your friends would like to play a puzzle game, then this app is perfect for you! You only need to designate a narrator who will read the riddle (and the solution) and then answer yes or no to questions. This app is fun to play, I assure you! Pop N Blast is not only an addictive and fun puzzle game: it is a challenge. It starts with a simple concept: pop and blast anything on the screen. Seems simple, right? But be careful: your number of actions is limited. Make good use of the power-ups to solve each puzzle. Pop N Blast is totally addictive and includes more than 1,500 challenging puzzles that will really twist your neurons. As cells pop they generate relaxing melodies that will relieve the stress of your day while having fun. The simple and unique design of Pop N Blast helps you stay focused on the most important part: the game! And the fun does not stop here: Pop N Blast includes a strategic multiplayer mode with up to 4 players. In this mode you pop your cells in order to blast and take over all your opponents cells. Some people say it is like a chess game but even better. Make strategic moves to defeat your opponents. The goal is to clear all the cells of each puzzle in a limited number of actions. The key is to pop cells to trigger chain reactions in order to blast all the other cells. Make good use of the power-ups to solve a puzzle. The Battle mode is a strategic and reflection multiplayer game that can be compared to chess. The goal is to place and pop cells on a grid in order to blast and take over the cells of the other opponents. Try to predict your opponents move in order to win the game. For now, there are more than 1,500 puzzles, and more to come. The battle mode offers more than 10 different grids to increase the fun. While the first levels are quite easy, the increasing difficulty of the puzzle will really put your reflection at its limit. If a level is too challenging, the power-ups will definitely help you to beat the game. As mentioned above, the goal of the game is to clear all the cells in that particular level. The challenge here is to accomplish that goal in the specified number of touches. You must conjure a strategy to be able to pop all cells within the specified number of touches. Basically, a cell transforms with each touch and the last transformation pops the surrounding cells, thus triggering a chain reaction of popping cells. This game is quite addicting and relaxing at the same time. The popping effects are simple yet elegant. I have finished Level 10 and I hope to conquer the higher levels. My account here on WordPress is just the basic account thus I am not allowed to post video clips. I hope to upgrade my account in the near future – as soon as I get hold of some funds! Save and Extend Your Battery Life with one-tap easy optimiser. Measures vibrations on all 3 axes: X, Y, Z and shows reference to earthquake vibrations as classified by Mercalli intensity scale. I just saw this app on Google Play and I tried it. I think it is indeed a must-have for smartphones! It has 32 useful apps which are listed above. The purpose of this post is just to show you the different apps within the Smart Kit 360 app. Most of the app’s functionalities are self-explanatory anyway and I do not want to bore you with too much details. Quite a lot of apps, isn’t it? The advantage is that you do not need to install separate apps for the ruler, unit converter, etc thus this app helps lower RAM consumption. The apps are also easy to use since you can activate widgets for each of them. Unfortunately, my phone is just a very basic smartphone thus I was not able to test the apps requiring sensors (magnetic sensors, leveller etc). The heart rate monitor is what intrigued me, I wonder how it works. What do you think? If you are the owner of Your Novice App reviewer, or someone who enjoys this blog why not upgrade it to a Featured Listing or Permanent Listing?